Add Ski3 polyclonal antibody - Classic to my shopping cart. Request a quote for a bulk order for Ski3 polyclonal antibody - Classic. Please fill out the form here below. Your local sales account manager will get in touch with you shortly and send you a quotation based on your requirements. 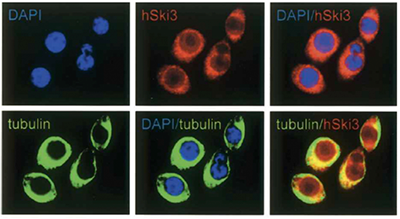 Polyclonal antibody raised in rabbit against human SKI3, using a recombinant protein. 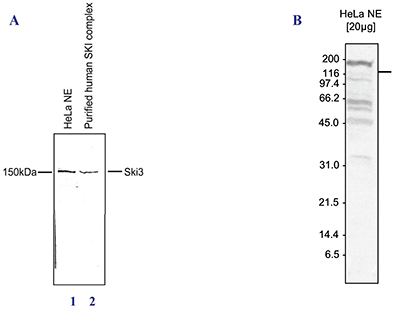 Western blot was performed on HeLa nuclear extracts (lane 1) and on the purified human SKI complex (lane 2) (Figure 1A), or on nuclear extracts from HeLa cells (HeLa NE, 20 μg) (Figure 1B) using the Diagenode antibody against SKI3 (Cat. No. pAb-011-150) diluted 1:1,000. The location of the protein is indicated on the right, the marker (in kDa) is shown on the left. HeLa cells were stained with the Diagenode antibody against SKI3 (Cat. No. pAb-011-150) (in red), with DAPI to label the DNA (in blue), and with an antibody against α-tubulin to label the cytoplasm (in green). SKI3 is detected in both the cytoplasm and the nucleus but appears to be excluded from the nucleolus. Diagenode strongly recommends using this:	Ski3 polyclonal antibody - Classic (Diagenode Cat# C15410011 Lot# 001). Click here to copy to clipboard.